With prices ever rising for the most famous appellations of Burgundy, it is the villages that lie just behind the front line which provide the best value. The potential of these villages has been enhanced in recent years by the higher temperatures associated with global warming One such village is Monthélie, tucked in behind Meursault and Volnay. It shares its best vineyard, Les Duresses, with neighbouring Auxey. Les Duresses is on a steep east-facing slope that catches the morning sun. 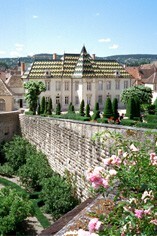 Bouchard Père and Fils, one of the grand old houses of Burgundy, was rescued from the doldrums in the 1990s by Joseph Henriot, of Champagne fame. Their veteran winemaker, Philippe Prost, keeps turning out beautiful wines, especially when aided by the sunshine of the 2009 vintage. 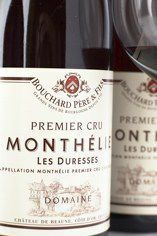 The Burgundian wine domaine of Bouchard Pére et Fils can trace its origins back to 1731 though it is no longer family owned. In 1995 the Champagne house, Joseph Henriot, acquired the company and quality has risen as a consequence. Today Bouchard is led by Stéphane Follin Arbelet while the wines are made by Philippe Prost who has been with the company since 1978. An impressive gravity-flow winery on the Route de Savigny, the Cuvérie St Vincent, was completed in 2005, enabling them, to process all their wines with optimum efficiency. Bouchard’s total holdings comprise 130 hectares, including 12ha of grand crus and 74ha of premier crus, which makes them the largest vineyard owners in the Côte d’Or (Côte de Nuits and Côte de Beaune). Bouchard have good holdings in the village of Monthélie, which lies just beyond Volnay and looks down over Meursault. The village is best known for its red wines, a little firmer in structure than Volnay and of particular interest in perfect summers when the grapes can ripen fully. A small village nestling in a valley behind Meursault and Volnay, Monthelie produces mostly red wines, mini-Volnays with appealing fruit but sometimes a rustic edge, and a small amount of white wine. The best wines come from the steep slopes above the village, such as Les Duresses. 109 hectares of village Monthelie. 31 hectares of premier cru vineyards (11 in all). Best vineyard is Les Duresses.